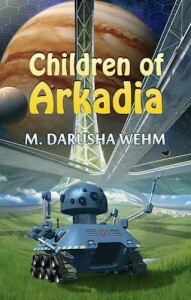 Bundoran Press recently releases Children of Arkadia, a novel by M. Darusha Wehm, a Canadian science fiction and fantasy author. Darusha is a three-time Parsec Award finalist and author of the five SF novels Children of Arkadia, Beautiful Red, Self Made, Act of Will and The Beauty of Our Weapons. Her novelette, Fire. Escape., was shortlisted for a 2012 Sir Julius Vogel Award. Her short fiction has appeared in many venues, including Andromeda Spaceways Inflight Magazine and Escape Pod. She is also the founder and editor of Plan B Magazine which focuses on short mystery and crime fiction. This is a recent conversation with M. Darusha Wehm. 1) How did Bundoran Press end up with your novel, Children of Arkadia? Were you targeting a Canadian publisher? I wasn’t targeting a Canadian publisher specifically, but I knew that a small press with a particular niche would be a good home for the book. It’s political science fiction with a certain sensibility. Bundoran Press was already on my radar with Strange Bedfellows, its anthology of political SF stories, so when I saw their call for novel submissions it seemed like it might be a good fit. Happily, Hayden Trenholm, Bundoran’s publisher/editor, agreed. 2) How much is Children of Arkadia influenced by your travel, transition and change from Canada to New Zealand? Did it change your views of the world around you? How did you end up in Wellington (a beautiful city I had the pleasure to explore in one of my previous travels)? The first iteration was written before I left Canada but the major revisions that actually make up most of the final book were done after I’d moved to New Zealand, so the book has a strange lineage in that sense. It’s hard for me to determine exactly what influenced what at this point, but I am generally interested in how people adapt to new places and new experiences. That’s part of what motivated me to travel in the first place, and having lived in several countries, I’m sure my general outlook is influenced by the things I’ve learned from the different cultures I’ve encountered. Wellington is a great city for a science fiction writer — there’s an extensive literary community as well as a strong SFF fandom here. My mother is originally from Wellington and spoke of it fondly, so I was predisposed to want to go there. It has a great culture and I found it very homey, so it seemed like the obvious place to stay for a while. 3) You were living in a boat for several years and sailing around the Pacific. Where did you travel? Any interesting tales to share? Did they end up in your stories? How much writings did you get done? Was it easier or tougher to write while you were travelling? My partner and I left from Vancouver Island in Western Canada, then harbour-hopped down the Pacific coast of the US, to Mexico, El Salvador, Nicaragua, Costa Rica, Ecuador (including the Galápagos), across the Pacific to French Polynesia, the Cook Islands, Samoa, Tonga, New Zealand, Fiji then back to New Zealand. Along the way I started and completed three novels and a bunch of short stories. I thought that not having a day job would make writing easier, but there are always distractions — no less when one is surrounded by the amazing variety of nature and culture. We’ve had many adventures traveling, but most take a while to tell. Our most repeated story is the Galápagos Shipwreck, and anyone interested in long distance sailing or long term travelling is welcome to check out our sailing blog where there is probably more information than you’d ever want. 4) I notice you have recipes of Arkadia on your website. What prompts you to come up with the idea? Food is a big deal for the people of Arkadia, given that they are building their entire society from scratch, including agriculture. Food is also a big deal for cruising sailors, since you never know what you’re going to find in any given port and you have to learn to be creative in the galley. I became a pretty decent experimental cook as a sailor, so had a bunch of recipes in my back pocket that could be easily adapted to a closed environment like Arkadia. It seemed like an obvious thing to share the details of those recipes on my blog — a little bonus content for the foodies among my readers. 5) Tell us more about Plan B, a crime and mystery magazine. Why did you start the magazine? What have you learn from it? I’ve always loved mystery fiction, but never written much of it. When I thought about maybe starting on some crime short stories, I looked around at the markets and discovered that the SFF short fiction market is light years ahead of the mystery market. As a hopeless devotee of the DIY ethos, instead of complaining I decided to do something about it and started Plan B. Working on the other side of the editorial desk has been great for me as a writer — I understand the submission process much better now and know how tough it is for the editor to reject work that writers have poured their hearts and souls into. We don’t say no lightly, and knowing that helped me in my own submissions. I also take an active hand in editing every story we publish, which has made me more critical in my own work. Of course, reading a lot helps any writer, and with open submissions, reading a lot is guaranteed. 6) Take us behind the scene of producing Plan B podcast, the stages from manuscript acquisition to podcast online. Tom Richter, our podcast editor, does most of the heavy lifting for the podcast and I’m grateful for his talent and enthusiasm for the project. We buy audio rights as part of our standard contract now, and once all the stories for a volume are contracted I send Tom the lineup and manuscripts. He records them (we do have a few guest readers on occasion, including me sometimes), then Tom does the post production and uploads the files. I take care of the website, feeds and iTunes integration. 7) Tell us about your upcoming trip to North America (When Words Collide, Worldcon) and what would you be doing? I’m based in Canada for June through August (endless summer for the win!) and will be at When Words Collide in Calgary and Worldcon in Spokane. My schedules for the cons are still up in the air, but I’m the one with the little blue mohawk and a handful of copies of Children of Arkadia. If you see me, stop by and say hi! 8) How is the speculative fiction market in New Zealand doing (from the writer’s and reader’s perspective)? How about the mystery market? Speculative fiction is huge in New Zealand, as evidenced by the recent winners and shortlists for the Sir Julius Vogel Awards, the national New Zealand SF/F/H awards. Big house-published books by internationally known authors stand alongside books produced by several local small presses, including some that focus only on SFF, like Steam Press and Paper Road Press. The mystery scene in New Zealand, like the rest of the world, is smaller and more novel-focussed, although with Dame Ngaio Marsh in our history, mystery is still well represented in NZ. 9) Who are your favourite Kiwi authors? Of course, Eleanor Catton (The Luminaries) and Elizabeth Knox (Wake) are names many international readers will know. However, my favourite Kiwi book of last year was Engines of Empathy by Paul Mannering. Sort of a Jasper Fforde/Douglas Adams style of secondary world adventure, where machines are powered by emotions. A really great read that I’d like to see get some international love. 10) Tell us about your role in Speculative Fiction New Zealand (SpecFicNZ). How active is the organization? Any special events? I’m on the core committee for SpecFicNZ, where I mainly poke at the website and keep it going. The organization has grown a lot in the last few years: we’ll be awarding our first publishing grant to local projects this year, as well as running in-person meetings, an online critique group and providing local and international information about markets and general publishing news to our membership. 11) What are your current projects? I don’t like to talk about works in progress in too much detail, but I’ve got an experimental SF novel-in-stories in the hopper, a mainstream Canadiana novel out on submission and I’m working on an episodic serial project.